The loans of the German Reich were issued from 1877, with an ornate design as can be seen above. On the left of the paper, the Goddess Germania is depicted with sword and shield. The Reichs Eagle with its crown can been see above and in the underprint.. In the header of the loan is the title “Loan of the German Reich” and its year of issue. The certificates bear the facsimile signature of the Reichs Debt Administration; the director always signs first on the left. They have a watermark with the text “Reichsschuldenverwaltung”. This design remains the same throughout the reign of the German Kaiser until 1918. Colour schemes alone are altered according to the issues. 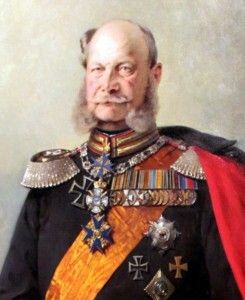 From the introduction of the Germania loans until 1885 the interest rate was 4 percent. It then fell to 3½% until 1890, and again to 3%, before rising to 4% innterest payments were half yearly. Before WWI, the total debt of the German Reich was 7bn Marks. The first German colony, German South-West Africa, dates back to 1884. However, it took 24 years and the Supplementary Act of 1908, until the German Colony war able to issue its own debt independently, with a Reich guarantee. The Act only defined redemption. The first six years were free of redemption, afterwards 0.6 percent was repaid. All the other conditions of the loan, such as the amount, interest, and price of issue were determined by the German Chancellor. In 1914 the amount of the outstanding Protectorates loans was 282 Mio. Mark. Redemption continued until 1928. 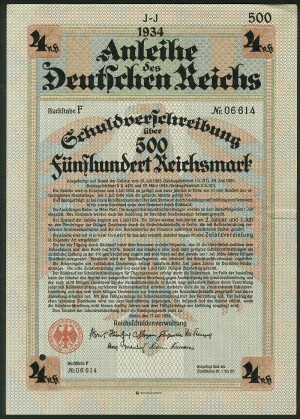 The German Reich issued special war bonds to finance the gigantic expenses of the army and navy. Many citizens bought these in support of their solders at the frontline. With the first war loan alone the German Reich was able to collect as much as 4.5 bn Reichsmark: An enormous amount that corresponded to a tenth of the German GDP at that time. During WWI, Germany issued a total of nine loans. 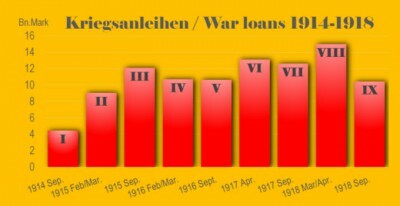 The largest loan was the eighth loan in Spring of 1918 at 15 bn Mark. In total the German Reich borrowed 98 bn Marks from the public. This covered approximately 85 percent of all the war expenditures. For the Reich these loans were the most apt instrument for war financing, given the paucity of alternatives. Increasing taxes was not an option, as it would have created unrest in the already heavily burdened public. From international capital markets, Germany was largely isolated and unable to get new funds, unlike its wartime enemies England and France, which were able to borrow money from the future ally, the United States. From the outset, advertising of the war loans was widespread. Poster had particular exposure like the one above with a German solder with glowing eyes and patriotic slogans like “Help us win! Subscribe to War Loans.” These posters were very popular and could be seen on most street corners. It was clear that war would not be won without full mobilisation of the whole of German society. Actually, with this publicity campaign the Reich succeed in securing additional finance not only from the middle class, but also, for the first time, from the working class, some of whom had very few savings. It was the ordinary German who financed the state: employees, farmers, artisans and even manual workers. They all subscribed to these War loans which were issued two times per year and received a standardized return of five percent. The loans were sold through banks and – at that time a novelty – by savings bank. They were available from 100 Mark, which corresponded to one month’s salary for a skilled factory worker. As is common in war times there was a lot of money in circulation, but a scarcity of goods and services for households to buy. Hence, people saw in these war loans a good and secure investment, in which they would put their money voluntarily. Additionally, there was high moral pressure on the subscribers of the loans. They did not want to abandon their own troops and saw it as their patriotic duty to finance the war. The public’s moral support for the army was steadfast throughout the war, as was it financial support. The German people were convinced that the war would be won and the Reich would not default on its debt. 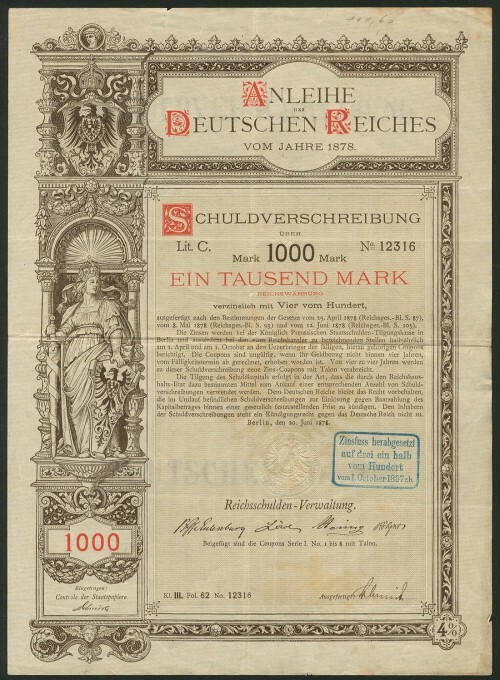 In the year 1919, the Reich’s total debt, including short-term liabilities, reached 156 bn Reichsmark – a gigantic sum indeed. The issuing of the loans by the Reich had to be approved by the Deutsche Reichstag. The decision by the German Social Democrat Party to approve the first war loan in 1914, was controversial and of particular historical consequence: it led subsequently to the division of the German labour movement. With the outbreak of war, the stock exchanges in Germany, as in most European countries, were closed. Shares trading resumed after a year, but issuing and trading of loans was forbidden during the entire war up until 1919. The only investment opportunity for investors in bonds was buying War loans. The issuance of the single issue of the war loans was ordinarily accompanied by a prior issuance of seven-year treasury bills, which were financed immediately and directly by the Reichsbank. The Weimar Republic emerged following Germany’s defeat and the collapse of its Empire which culminated in the exiling of its Emperor to Dutch territory. The German economy was in a parlous state, and thousands of soldiers sought new employment. Fear of revolution was widespread. At the same time, Germany faced gigantic claims for war reparation by the Allies. The London Ultimatum in May 1921 ordered Germany to pay reparation of 132 bn Goldmark. 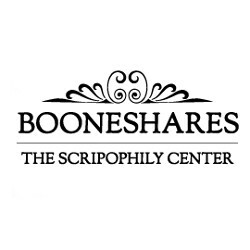 A large part of state spending had to be financed by credit: as finance could not be raised by taxation, the state’s printing presses were set in motion. What followed was the most radical hyperinflation of an industrial nation in history. All attempts by the government of the Reich to finance its gigantic need for capital by raising of credit from voluntary creditors was doomed to fail, given the turmoil in capital markets amidst the collapse of the German currency. The bonds were creatively structured: they were set up to play on investor irrationality by offering a chance at a large win from a lottery. 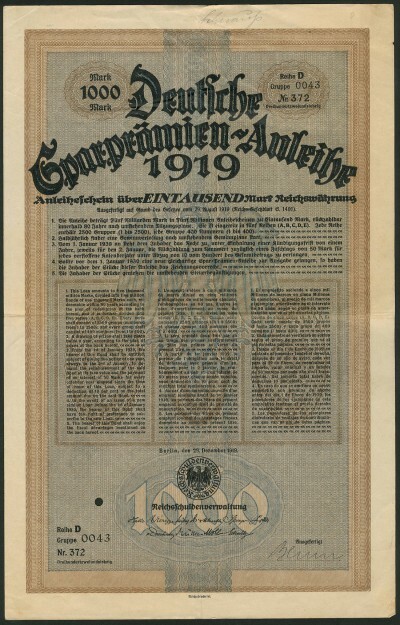 By signing the first German loan after the war, the Deutsche Sparprämien-Anleihe 1919 at 1000 Mark, investors had the possibility to become millionaires. While the loan did not bear any interest, the owner, however, participated in a half-yearly drawing with 2500 winners, with amount between 1000 Mark (1000 winners) and 1 Million Mark (5 winners). The issue was discontinued however, due to a lack of demand. In 1922 the government under Reich President Ebert found itself obliged to finance itself via a forced loan from its citizens. All person with a wealth higher than 100’000 Mark were obligated to provide finance of up to 10% of the value of their assets. The loan did not bear any interest until 1925, between 1925 and 1930 it bore 4 Percent and from 1930, 5 Percent. The hyperinflation had a devastating effect on the value of the forced loan, but also on all earlier Mark denominated loans. The massive depreciation of the currency meant that these loans lost practically all their value. This was may be a good thing for the German Reich Finances, as the total debt of the German Reich evaporated into thin air. The German savers on the other hand were practically expropriated; their papers had lost all their value. A large part of the population became impoverished. This trauma of the great inflation is still today imprinted into the collective memory of the Germans. 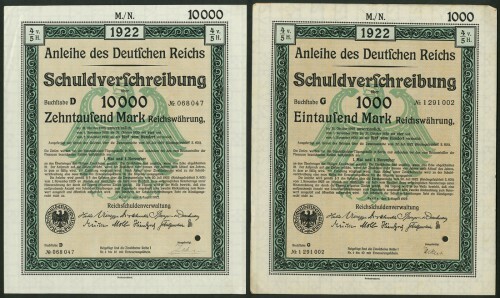 After the successful stabilisation of the currency and the introduction of the Rentenmark which replaced the Reichsmark in September 1924, the owner of loan of the German Reich was compensated for their loss with new certificates of the ‘Replacement Loan’ of 1925. The conversion rate was between 2½ and 15 Percent. The total value of this new loan was 1.7 bn. Reichsmark. The new bonds were not interest bearing until the termination of all German war reparations obligations to the allies. The bonds however were directly connected to a drawing certificate with the same nominal value. These drawing certificates participated in a yearly drawing of the redemption of five times their nominal value. After the seizure of power by the National Socialists, the Ermächtigungsgesetz transferred the right to approve new state loans from the Reichstag to the government of the Reich. The economic crisis of 1929 had destroyed the stability of German financial markets, which had been built up over the past 5 years. The president of the Reichsbank and minister of finance Hjalmar Schacht provided Hitler with the instrument to overcome the crisis, but also to finance the accelerated German armament. The system used by “Schacht” was at root a Keynesian approach: that the state increases its debt and, that would be reduced by increasing taxes after an economic recovery. The loans of the German Reich played a central role in the financing of the policy of the National Socialists. The German capital market had to serve extensively the demands for credit of the Reich. Private enterprise however had to rely on self-financing by retaining profits. All profit that went beyond 6 Percent, was skimmed off for an investment in loans of the Reich. They however renounced the use of “Volksanleihen” as in WW1, as these still were extremely unpopular. The position of the state in the capital market was so dominant, that the German Reich was even able to influence the condition of the loan in its favour. In 1934 nominal interest were 4%, between 1935 and 1937 4½, 1938 4% and 1941 even 3½%. The Deutsche Reich was able to finance itself without difficulty throughout the war. 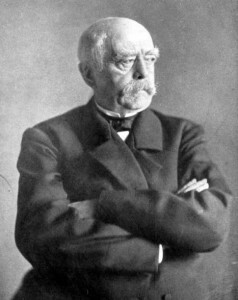 After the dismissal of its president, H. Schacht, in January 1939, the Reichsbank underwent fundamental reorganisation. It came under the direct authority of „Führer und Reichskanzler“ Adolf Hitler, who in this role was able to give credit to the Reich. He was now creditor and debtor at the same time. The Reichsbank and Reich’s Debt Administration were entirely subsumed into the Nazi war economy. This is the summary of the history of German State debt and the most important lots of the loan certificates offered for sale in the Spink auction. The sale includes additional and no less interesting loans of the German Reich and from several Länder (Federal states), such as Bavaria, Mecklenburg, and Thuringia amongst others. The online catalogue supplies pictures of all varieties offered (lots 194 to 259).